One day Jesus and his followers got into a boat. Jesus said to them, "Come with me across the lake." And so they started across. While they were sailing, Jesus slept. A big storm blew down on the lake. The boat began to fill with water. They were in danger. The followers went to Jesus and woke him. They said, "Master! Master! We will drown!" Jesus got up. He gave a command to the wind and the waves. The wind stopped, and the lake became calm. Jesus has been teaching about the power of his words and how we must obey them. Now, we see in a powerful demonstration of his authority, just how powerful the words are. Jesus speaks and the elements obey him. He is ruler over nature. 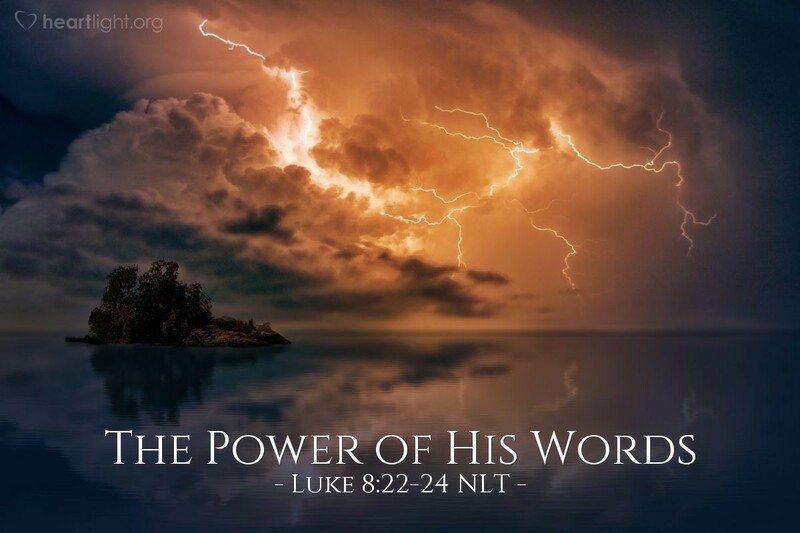 His words have power over the storm! Since Jesus' words are so powerful, shouldn't we obey his words, too? Wow! Father, your Son Jesus is awesome and glorious. His words have power over nature. He can calm the raging storm by simply speaking and it is so. My prayer is that his words will have that same impact on me. May the words Jesus speaks produce immediate results in my life. As I obey, I truly believe that those very words will calm the restlessness of my soul. In the mighty name of Jesus, I pray. Amen.